My job takes me to some interesting places in Arizona — many of which I might not otherwise have occasion to visit. Last month, I took an overnight trip to the White Mountains for a Scenic Drive slated to appear in Arizona Highways in 2016. From Phoenix, I headed up State Route 87 (the Beeline Highway). I stopped just outside of Payson to check out a B&B we're planning to feature next year. It's right next to the East Fork of the Verde River (pictured). Then I went east on State Route 260 toward Show Low, from where I took U.S. Route 60 east to Springerville. Then it was a short drive down U.S. Route 191 to Alpine (elevation 8,000 feet or so), where the drive for the magazine began. The route offered good views of New Mexico and the Blue Range Primitive Area (pictured). If you want to hear more about it, you can read about it next year. On the way back to Springerville, where I spent the night, I stopped at the Sipe White Mountain Wildlife Area. Near the turnoff is an overlook (pictured) that provides a nice panorama of Springerville. I had dinner at TrailRiders, which we featured in our 2014 Best Restaurants list. The following morning, I headed back through Alpine for breakfast at Bear Wallow Café (too early for Bear Wallow's famous pie, unfortunately). Both the town and the café thankfully escaped annihilation in the 2011 Wallow Fire, which burned more than a half-million acres of the surrounding forest. When I left the café, the temperature was a cool 68 degrees. Then I continued down U.S. 191, also known as the Coronado Trail Scenic Byway. This paved, winding two-lane road can be a challenge, and the speed limit drops to 25 mph in some places. 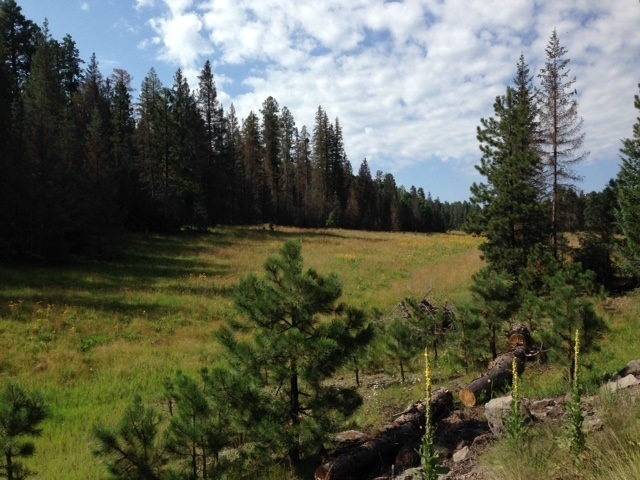 But it also offers beauties like Hannagan Meadow (pictured), right across the road from Hannagan Meadow Lodge. I continued through Morenci (home of the Morenci Mine) and Clifton, then got on U.S. Route 70 and went west through Safford. Finally, I got back on U.S. 60 in Globe and continued west back to the Phoenix area. In all, the trip was a more-than-manageable two-day journey and a welcome respite from the Valley's triple-digit heat. If you've got a couple of days to yourself, I highly recommend it. All photos by the author, who used his iPhone and makes no claims about their quality.